LA JOLLA, CA (US), September 2018 — Plastic surgery to treat large cutaneous ulcers, including those seen in people with severe burns, bedsores or chronic diseases such as diabetes, may someday be a thing of the past. 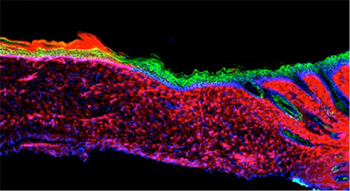 Scientists at the Salk Institute have developed a technique to directly convert the cells in an open wound into new skin cells. The approach relies on reprogramming the cells to a stem cell-like state and could be useful for healing skin damage, countering the effects of aging and helping better understand skin cancer. Cutaneous ulcers — wounds that can extend through multiple layers of the skin — are typically treated surgically by transplanting existing skin to cover the wound. However, when the ulcer is especially large it can be difficult for surgeons to graft enough skin. In these cases, researchers are able to isolate skin stem cells from a patient, grow them in the lab and transplant them back into the patient. However, such a procedure requires an extensive amount of time, which may put the patient’s life at risk and is sometimes not effective. Dr. Izpisua Belmonte and Salk research associate Masakazu Kurita, M.D., Ph.D., who has a background in plastic surgery, knew that a critical step in wound recovery was the migration — or transplantation — of basal keratinocytes into wounds. These stem cell-like cells act as precursors to the different types of skin cells. But large, severe wounds that have lost multiple layers of skin no longer have any basal keratinocytes. And even as these wounds heal, the cells multiplying in the area are mainly involved in wound closure and inflammation, rather than rebuilding healthy skin. Drs. Izpisua Belmonte and Kurita wanted to directly convert these other cells into basal keratinocytes — without ever taking them out of the body. “We set out to make skin where there was no skin to start with,” Dr. Kurita said. “Before going to the clinic, we have to do more studies on the long-term safety of our approach and enhance the efficiency as much as possible,” said Dr. Kurita. The current study is published in Nature. The image represents the first proof of principle for the successful regeneration of a functional organ (the skin) inside a mammal, by a technique known as AAV-based in vivo reprogramming. Epithelial (skin) tissues were generated by converting one cell type (red: mesenchymal cells) to another (green: basal keratinocytes) within a large ulcer in a laboratory mouse model. Image courtesy of the Salk Institute.